The Mint of Finland has launched (7th February) the latest coin in their current collector series focusing on past presidents of the Finnish state. The series is in conjunction with celebrations for Finland’s centennial anniversary of independence, which is officially marked later this year. 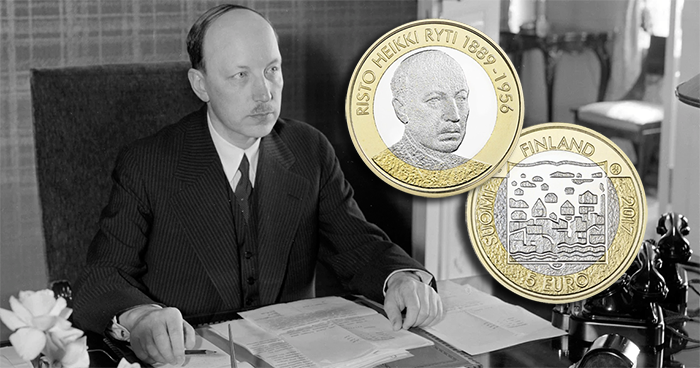 The latest coin in the series highlights the republic’s fifth president, Risto Ryti (1889–1956), who served as president from 1940 to 1944. He is remembered in Finnish history as the wartime president whose term was served during both the Continuation War of 1940–1944 and the Second World War, which occurred simultaneously, from 1940 to 1945. During Ryti’s term as president, Finland allied itself with the Third Reich as a means of fighting off Soviet aggression, but found itself also fighting traditional allies such as Great Britain and France. Ryti was also the country’s only president sentenced to a term in prison for war crimes; he was later pardoned by President Paasikivi, who was said to have noted the pardon was the most noble deed he had participated in within the last five years of his presidential term. 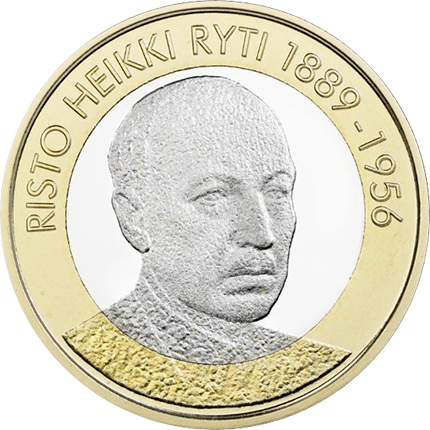 The coin is designed by Tero Lounas and includes a portrait of President Ryti facing toward the right with the text RISTO HEIKKI RYTI 1889–1956 above the primary design. The reverse features a landscape of Finnish fields, framed by an open book depicting a constructed urban environment. All coins in the series share the same reverse. The Risto Ryti collector coin is officially issued on the 6th March. The popular Presidents of Finland series is part of the Finland 100 programme celebrating the centenary of Finland’s independence. Coins featuring C.G.E. Mannerheim, J.K. Paasikivi, and U.K. Kekkonen will be released later in 2017, thus concluding the series in its entirety. 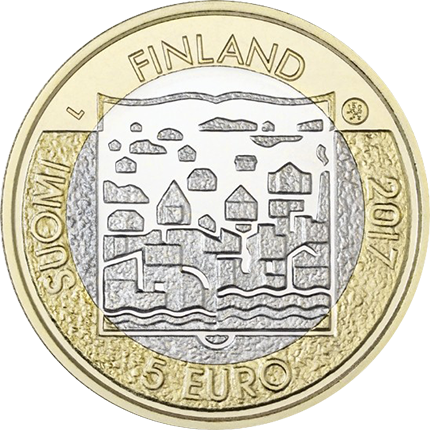 Advance orders for the collector coin may be placed in the online shop from the 20th February, at 9 a.m. For more information on this and other coins from the Mint of Finland, please visit their website. Born in 1889 in the village of Loima, Satakunta, a region of southwestern Finland, Risto Heikki Ryti came from a family of modest means—some have described his family as having come from the peasant classes. His father, Evert Ryti, was the owner of a large farm and was a more distant figure in his son’s life. Risto seemed eager to fulfill the expectations of his mother. He attended primary school only for a very short time before the director of an adult-education institute, who was himself a university graduate, was engaged as his home tutor. Of the seven sons in the Ryti family, Risto was the only one to pass the university entrance examinations, his brothers having received a middle level of education. Risto was sometimes described as having a serious looking expression with large eyes and a high forehead, especially since he started going bald while quite young. Ryti was not considered scholastically gifted, but he achieved good marks and passed his exams within a better-than-average pace, passing his university entrance examination in the spring of 1906. He enrolled that autumn to the law faculty of the Imperial Alexander University of Helsinki. He received his lessons, which began in an atmosphere of freedom, in the Swedish language. They ended three years later in the autumn of 1909, when Finland moved into the darker times of the second period of what was referred to as “Russification.” Finland was at that time part of the Russian Empire with the status of Grand Duchy, but many official levels of society had been determined to integrate Finland and its people closer into the Russian culture and language. As a means of distancing himself from the oppressive political atmosphere of the capital, Ryti decided to move back to the town of Rauma in Satakunta after qualifying as a lawyer. Before he moved back to Satakunta, Ryti \ventured to Oxford with his friend Eric Serlachius. The time in Oxford resulted not only in his eventually receiving a degree in maritime law from Oxford University, but in his falling in love with Eric’s sister, Gerda Serlachius. Although Gerda was several years older than her future husband and had lived a very independent life, residing in both Britain and Germany, an engagement led to their marriage in 1916. The start of the Great War in 1914 and Finland’s own civil war in 1917 also interrupted his studies. One of the more important chance meetings at this time in Ryti’s life was with industrialist and philanthropist Alfred Kordelin, who was considered Finland’s richest man at the time. The acquaintanceship evolved into a client relationship beneficial to Ryti. It was said that Ryti’s relationship with Kordelin was due to his trait of looking much older than his years and his ability to evoke knowledge and trust—qualities that were to hold him in good stead with not only Kordelin but many whom he encountered in business. During Finland’s struggle with achieving independence, Ryti’s career was already on the rise due to his relationship with Kordelin. Risto Ryti’s career might have gone in a very different direction had it not been for the untimely death of Kordelin, who was murdered on the 7th November 1917 by a Russian sailor who supported the new Bolshevik government in Russia. Ryti was named Kordelin’s executor; a year later, with Kordelin’s assets, the Kordelin Foundation, funding educational projects in Finland, was established. It continues to this day. During the civil war, Ryti was forced to stay in hiding with his family in Bolshevik-controlled Helsinki. With peace, his period in the private sector was brief since he was now a supporter of the Progressive movement and a staunch republican. He was elected to the country’s new parliament in 1919 as the second-youngest member. In April 1921, at the age of just 32, he was appointed finance minister in the government of Juho Vennola, and during that decade he was twice finance minister. As finance minister and then as governor of the Bank of Finland, it was his fiscal goal to tie the value of the Finnish markka to the gold standard. In Ryti’s opinion, the gold standard was the world’s best monetary system and the one that best served Finland’s increasing economic growth. The onset of the Great Depression in 1929 dealt a severe blow to the Ryti’s rationale. Finland, following the example of countries such as Great Britain and the United States, was forced to abandon the gold standard after only five years. 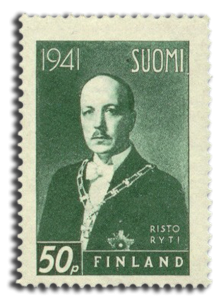 Risto Ryti was elected to parliament three times, and it is worth noting that he nearly became president of the Republic of Finland in the 1925 election at the age of just 36. In the final round of voting, the Swedish People’s Party (which held the balance of power) considered Ryti a more inappropriate opponent than Lauri Kristian Relander of the Agrarian Party, and Ryti was defeated. Under the presidency of Kyösti Kallio, fourth president of Finland (1937–1940), Ryti was appointed prime minister. Nazi Germany under the Third Reich was on the verge of invading their neighbours in pursuit of conquering as much of the continent as possible, and Finland was now embroiled with a fight of their own separate from the inclinations of the Third Reich. Their previous masters in Russia—now known as the Union of Soviet Socialist Republics—had threatened Finland with both invasion and forced incorporation into their new geopolitical entity. As a finance minister, Ryti was adamantly opposed to state intervention in business and industry. He also was certainly opposed to socialist doctrine, since his personal belief was that the more state authorities influenced the economy, the greater were the negative effects. For this reason alone, socialist economic as well as social policies, and especially their Soviet forms, were repugnant to him. He was especially and uncompromisingly anti-Soviet, remembering their policies and influence after the Russification period and the civil war. As much as he was opposed to Soviet influence he was also vehemently opposed to German national socialist influence; nor did he approve of their doctrine, since, according to his ideas on economic theory, it was not a viable model. More especially, German culture was alien to him. This sentiment was strong where his country was concerned and it was more important to repulse their influence in political policy. The Lapua movement and right-wing extremism in all its forms were also unacceptable to Ryti’s mission for his young country. Ryti was himself a great admirer of British civilisation with its centuries-old parliament, which he had learned about while living in Oxford. He also admired the American free-enterprise practises and wanted to replicate some of this success in Finland. At the same time that the Third Reich had begun their assault on Poland and other countries on the continent, the Soviet Union embarked on their own assault on Finland. Red forces invaded sovereign Finnish territory on the 30th November 1939—just weeks after the Nazi invasion of Poland. The invasion was condemned by the League of Nations and the Soviet Union was expelled from the international body as punishment for their aggression. Prior to the invasion of Finland, Ryti had been offered the post of prime minister by the country’s fourth president, Kyösti Kallio, as Ryti had been seen as a conciliatory choice for the position. Initially, he had turned down the offer but after the aggression shown to his country by the Soviet Union, he reluctantly accepted. Finland was unprepared militarily. Although Finnish forces fought with distinction and bravery, the cause was hopeless, and Prime Minister Ryti, under instructions from his president, signed the peace treaty in Moscow on the president’s behalf, ending the 105-day-old conflict. As a consequence of the so-called peace treaty, much of the province of Karelia was ceded to Moscow in exchange for their promise of non-aggression against Finland. However, this peace would not last long, and the Soviet Union invaded Finnish territory again in June 1941. This move against Finland prompted Ryti to do the unthinkable—to ally Finland with the Third Reich, despite the fact that both Ryti and the new foreign minister, Vaino Tanner, had close contacts with the United Kingdom. The Soviet Union had even gone so far as to set up an alternative Finnish government, wholly bypassing the Kallio government and the premiership of Ryti. Eventually, by March 1940, this pseudo-state, which had been recognised by Moscow, was unrecognised and de-established and was merged with the new Karelian Soviet state, which had been created after its annexation from Finland. With the failing health of President Kallio becoming an impediment to governing, he resigned on the 19th December 1940 with the intention of retiring to his country home, having named Ryti his successor. Sadly, Kallio suffered a massive heart attack on the very day of his retirement and died just minutes after reviewing his honour guard at Helsinki’s Central Railway station. As the country was unable to hold elections due to the war and the fact that that part of Karelia had been annexed by the USSR, parliament passed an amendment to elect the president through their chambers, Ryti being elected overwhelmingly. Before Kallio had retired, he had named General Karl Mannerheim (1867–1951) as head of Finland’s armed forces, a position normally accorded to the Finnish head of state. This position was retained by Mannerheim even after Ryti was elected president. With the collapse of the previous Von Ribbentrop / Molotov agreement between the Third Reich and the USSR, whereby the two countries had agreed not to attack each other’s positions in Poland and the Baltics, the Third Reich began its assault on the USSR in June 1941. Finland had endeavoured to remain neutral, but this was not possible, and Finland entered into what was to be called the Continuation War: renewed fighting to win back Karelian territory and defeat Soviet forces. Karl Mannerheim had directed Finnish military forces since he was named to this post and continued his coordination with German forces until it became clear that Hitler was losing the war not only against the Allied forces on the western front but also against Soviet forces. On the 4th August 1944, Ryti reluctantly signed a letter of resignation as president, citing poor health as his reason, and presented his letter to the cabinet. Later that same day, parliament appointed Mannerheim as Ryti’s successor and Finland’s sixth president. Ryti returned to his previous job as governor of the Bank of Finland, which he had held before becoming prime minister. Ryti’s life took a surprising turn for the worse when, after the conclusion of the Second World War and the defeat of the Third Reich, pressure from the Soviet Union as well as from communists in the Finnish parliament demanded Ryti be put on trial as head of the government responsible for the Continuation War. Despite most Finns’ high regard for their former president, he was one of the main defendants in the so-called war-responsibility trials that commenced on the 15th November 1945, as a result of the Moscow Armistice signed in September 1944. Upon their conclusion in February 1946, President Ryti was sentenced to 10 years in prison, with the former foreign minister Vaino Tanner receiving a sentence of five years and six months. With the USSR’s eventual ratification of the Paris Peace Treaty in August 1947, which negotiated terms of peace with minor belligerents against the Allied forces and included Finland, the country’s seventh president, Juho Paasikivi (1870–1956), was able to pardon Ryti in May 1949. Despite comfortable treatment, Ryti’s health had failed during his three years and a half years in prison. Most of his stomach had been surgically removed due to a tumor, and he’d developed arthritis during his first winter of incarceration. Ryti did not return to public life but instead concentrated on writing his memoirs, which he did not complete owing to further poor health. Risto Ryti died on the 25th October 1956 and was accorded a state funeral with full presidential honours, the patriotic ceremony becoming an opportunity for many Finns to show their affection for their former wartime president and to display their appreciation and recognition of his life’s work. He is buried in Helsinki’s Hietaniemi Cemetery, considered the national resting place of the country’s former presidents and notable military figures.